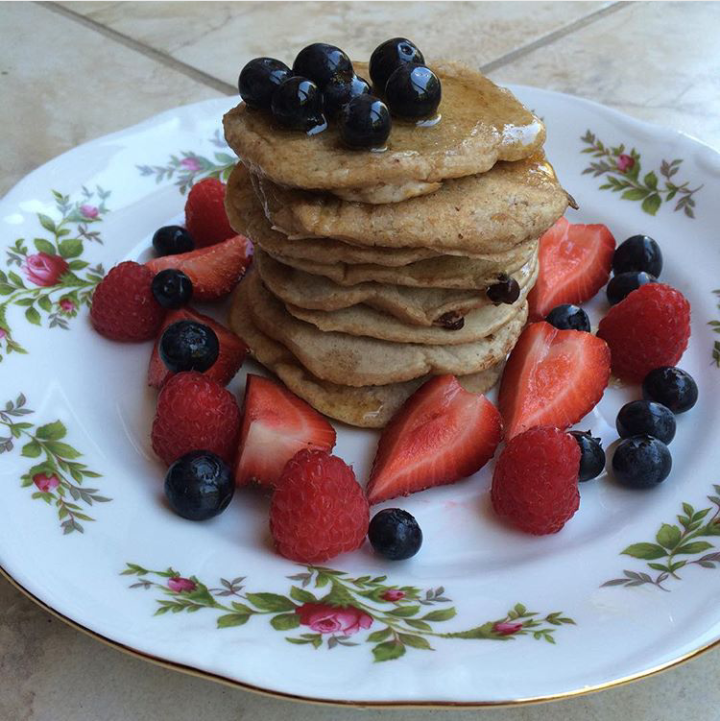 Vegan pancakes are really great for breakfast especially on a school/work day. I'm sure you will agree with me on that because everyone loves pancakes. But not everyone knows how to make them. Trust me, I know. I just couldn't get it right. If they were not burnt then they were sticky, gummy, undercooked and just tasted yucky. It took me a while and a tonne of reading to get things down to a "T" but it was all worth it. I'm a big fan of this Secrets to Perfect Pancakes article, they literally thought me everything I know. Step 1- Don't over mix your your ingredients. This is a really tempting and common thing to do. But if you do your pancakes will be tough, gummy and a bit yucky (kids hate that). Just a few tender swirls will be enough to mix the ingredients together well. And don't worry about getting out all of the lumps.... lumps are good. Step 2- Get the right temperature going. Straight off the bat, if your skillet/pan is too hot you're going burn your pancakes, and they are not going to be well cooked inside. You don't want the heat to be too low either or else the batter will stick to the pan and will be grossly undercooked. It's a good idea to drop a little of your batter into the oil and see how it goes. If the oil sizzles you're good to go. If not, you'll need to crank up the heat a bit. I remember burning my vegan pancakes (more than once)! I just didn't know when to turn them. Whenever I tried not to burn them I would turn them too quickly. But guess what? Pancakes come with their own personal timer. Yup, it's true. If the temperature is right then after about 2 minutes you should see little bubbles popping up. The bubbles indicate that it's time to flip. Two minutes on the other side and you will have a splendid pancake. Well that's just about it. One thing I want you to note though, you're pancakes taste so much better with friends and family so share the love and remember the secrets to perfect vegan pancakes. And here's a great vegan recipe to get you all started my friends, remember "vegan" because animals matter. Thanks a tonne to tonne to instargam user "basictoned" for sharing this awesome pic with us. Whisk together your flaxseed with 3 tablespoons of of water in a bowl and set aside to thicken. This is called flax egg. Add the flour, sugar, baking powder, baking soda and salt to a mixing bowl and mix together (just the dry stuff). In a separate bowl add your vegan milk and apple cider vinegar together (this is called butter milk). Add your coconut milk to this and your flax egg and mix well. Next use you dry ingredients to form a well in the centre of the bowl, pour the wet ingredients gently into the well. Slowly stir until most of the batter is mixed in. And remember our secret tips about our friendly lumps. Next heat your pan for about 5 minutes over a medium flame then spread a little vegetable/coconut oil over the bottom of the pan using a paper towel or pastry brush. Next test to ensure that the heat is right. Add some of your batter to the pan and see if it sizzles and forms bubbles in about 2 minutes, if so, you're good to go. Add about 1/4 cups of your batter to the pan to make each pancake, you can make 2-4 if your pan is large enough. When you see bubbles after 1-2 minutes it's time to flip. Let the pancakes cook for another two minutes and then you're all set. That's it my friends... you're vegan pancakes are ready and dying to be eaten. You can add maple syrup, berries, chocolate or whatever you like to top off your pancakes. I'll tell you a secret, by the time I’m done making these guys half of them have already been eaten.... now it's your turn to have a blast!! !